I have been making small bears here in Australia for about 8 years, after trialling a pattern found in a craft magazine. I have also been a golly lover for as long as I can remember. My creations have diversified to include- small bears & gollies, miniatures, mini purses, and hand made tiny fabric and painted brooches/pins. In 2002 & 2003, I designed a number of enamelled brooches and screen printed golly and teddy bear tea towels (dishtowels for US readers). I have another badge design this year that will be available in September. I choose to use only quality fabrics- English & German mohair, super plush, upholstery velvet, cashmere and ultra-suede which allow me to create the pieces that are under 2". Some are "one offs" or very limited editions and all are made to my own original patterns and ideas. * The pictures shown are of the proto-type and copies may vary slightly from the original. 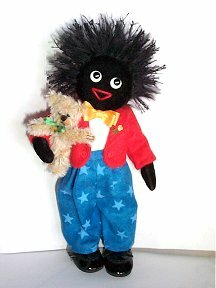 My love of golliwogs and my aim to improve their reputation has resulted in the development of a number of original designs which have proved very popular- especially since their centenary in 1995. I am currently a member of the International Golly Collectors Club in the US. I have created an entry for the IGCC's annual Gollyfest competition 3 times. "Ozzie& Ko" was selected as the event golly for Gollyfest 4 in Toledo, Ohio (USA) which I attended in July 2000. He was made in a limited edition of 35 and was a 4" golly cuddling a 1" koala. An article written by William H. (Bill) Boyd was published in Teddy Bear Review (USA) in Jan/ Feb 2000 edition and pictured my entry and a brief write up. Bill featured me and my work in his column in Teddy bear Review in October 2003. I am happy to say I also attended Gollyfest in San Diego CA in January 2003. It was a very friendly, memorable event which allowed me to meet so many other wonderful golly collectors, customers and friends. My entry in the event golly competition this year also won so I will be stitching a limited edition to be sold through the club at the next Gollifest. Whilst in San Diego I attended the Linda Mullins Doll & Bear Show. My entry into the "Golly" category of her competition was awarded first prize so I brought home a huge rosette and a medallion along with a grin from ear to ear! I believe originality in design, use of high quality components, interesting presentation and quality control of the end product to be of greatest importance when creating my bears and gollies. I enjoy the personal contacts I've made with other bear /golly artists and collectors both here and Internet-based contacts abroad. 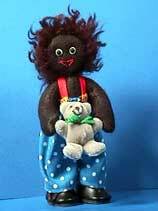 Bear and Golliwog lovers are the same the world over- great people! My work is sold in a number of retail outlets in Melbourne, Perth, Hobart, Brisbane, Adelaide and country Victoria (Australia) and since launching my web site, to buyers in England, Holland, New Zealand, Canada and the USA. 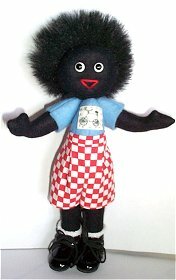 "The Golliwogg's Bicycle Club" is the theme for the next Gollyfest to be held in Toronto, Canada in 2004. I will also be attending this event. For information and dates see Gollyfest website. All items are available from me direct and I also am happy to quote wholesale prices to retail outlets. Please let me know the currency you require a current pricelist quoted in. "Doll Castle News" Jan/Feb 2002 features two of my gollies on the front cover. Inside you can read the cover story about me. Other Articles: * "Teddy Bear Review" Jan/Feb 2000 page 126 in William H. (Bill) Boyd's column. * "Teddy Bear Review" October 2003 also had a story in William H. (Bill) Boyd's column. Meeting R John Wright at Gollyfest in July 2000. Gollyfest 2000 Event Golly- "Ozzie & Ko". LE of 2, 4" tall. Gollyfest 2004 Event golly "Gollywoggs Bicycle Club". LE of 20, 8" tall. 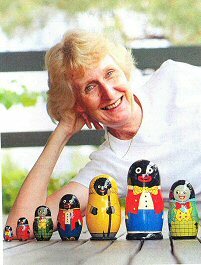 In the February 2005 edition of their "Home" magazine, the Weekly Times featured me and my gollies- including my golly collecting.